Included among the 50 exciting discoveries about Pluto, are its possible ice volcanoes and moons that orbit the planet like spinning tops, researchers on the New Horizons team from NASA’s Ames Research Center at Mountain View, California, announced at the 47th Annual Meeting of the American Astronomical Society’s Division for Planetary Sciences in National Harbor, Maryland. New Horizons is an interplanetary space probe that was launched on 19th January, 2006, as part of NASA’s New Frontiers program. On 14th July, 2015, it flew very close (12,500 kilometers – 7,800 miles) to Pluto’s surface, making it the first spacecraft ever to explore the dwarf planet. New Horizons geologists combined pictures of Pluto’s surface to create 3-D maps that suggest that the dwarf planet’s most distinctive mountains may be cryovolcanoes, i.e. ice volcanoes that could have been active in the recent geological past. The two ice-volcano candidates are enormous features, measuring tens of miles across and several miles high. Even though they look like the volcanoes that spew the molten rock we are used to here on Earth, the cryovolcanoes on Pluto are likely to emit a melted slurry of substances including ammonia or methane, nitrogen, and water ice. If the presence of volcanoes on Pluto is confirmed, scientists will have a vital clue to its atmospheric and geologic evolution. The surface of Pluto ranges in age – from relatively young, to intermediate, to ancient – according to new data gathered from New Horizons. Space scientists count the number of crater impacts to determine how old a surface area of a planet is. 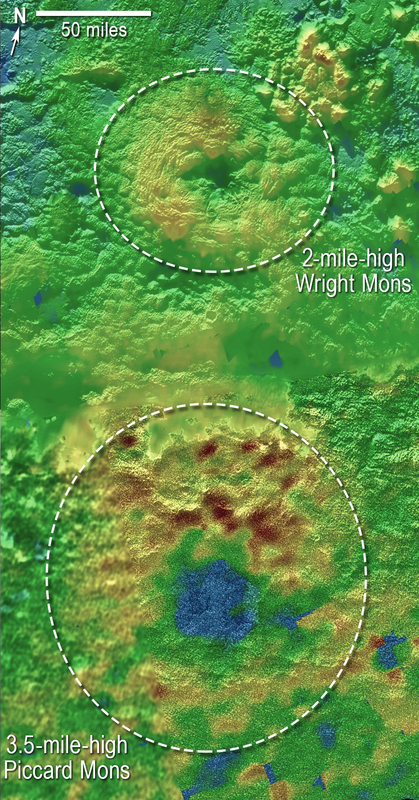 Older regions tend to have a higher density of crater impacts. According to crater counts of Pluto’s surface areas, some regions date back to just after the planets of our solar system were formed, approximately four billion years ago. However, vast areas of the dwarf planet’s surface were ‘born yesterday’, geologically speaking. They were probably formed within the last 10 million years. This region, called Sputnik Planum, appears on the left side of Pluto’s ‘heart’ – according to images received so far, it has no craters at all. New crater-count data also reveal the presence of ‘middle-aged’ (intermediate) terrains on Pluto’s surface, suggesting that Sputnik Planum is not an anomaly. In other words, throughout most of its 4-billion-year history, Pluto has probably been geologically active. The New Horizons team says the crater counts are giving them a new insight into the structure of the Kuiper Belt itself. Pluto is in the Kuiper Belt – a region of the Solar System beyond the planets, extending from Neptune’s orbit (at 30 AU) to about 50 AU from the Sun (1 AU = the average distance from the Earth to the Sun). Pluto and its large moon Charon have relatively few smaller craters. This suggests that the Kuiper Belt, the least-explored region of our solar system, probably had fewer smaller objects than scientists believe. A ‘smaller object’, in this text, is half-a-mile across or less. New Horizons scientists now doubt whether Kuiper Belt objects formed by accumulating much smaller objects (a longstanding model). The dearth of small craters on Charon and Pluto support other models that theorize that larger Kuiper Belt objects may have formed directly, i.e. they were about the same size when formed as they are now. In fact, this new evidence suggesting that most Kuiper Belt objects were ‘born large’ has researchers excited that New Horizons’ next potential target – the 40 to 50 kilometer wide KBO (Kuiper Belt Object) called 2014 MU69 – may offer the first detailed observation of such a pristine, original building block of our solar system. The New Horizons team is also learning a great deal about Pluto’s amazing system of moons, and their fascinating properties. Virtually every other moon in our solar system, including Earth’s moon, has one side facing toward the planet all the time – it is in synchronous rotation. Pluto’s small moons are different. Pluto’s small moons rotate rapidly. Hydra, for example, its most distant moon, rotates 89 times during a single lap around the dwarf planet. The researchers think these spin rates are not constant, because Charon exerts a powerful torque that prevents the small moons from settling down into synchronous rotation. The scientists were also surprised at how much Puto’s moons wobble. Images of Pluto’s four smallest moons suggest some of them could have merged with other moons in the past. This NASA animation shows Pluto’s small moons behaving like spinning tops as they orbit the dwarf planet.